Religious Cowboy The devout cowboy lost his favorite Bible while he was mending fences out on the range. 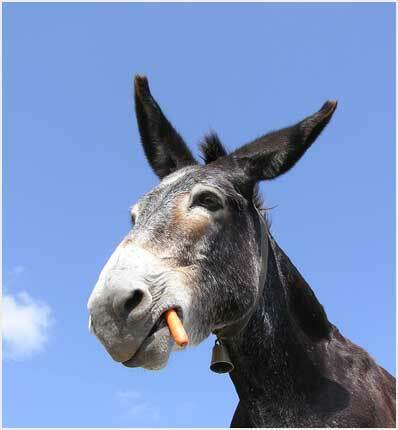 Three weeks later, a donkey walked up to him carrying the Bible in its mouth. The cowboy couldn't believe his eyes. He took the precious book out of the donkey's mouth, raised his eyes heavenward and exclaimed, "It's a miracle!" "Not really," said the donkey. "Your name is written inside the cover." Movies A man in a movie theater notices what looks like a donkey sitting next to him. "Are you a donkey?" asked the man, surprised. "Yes." "What are you doing at the movies?" The donkey replied, "Well, I liked the book." Front Seat A policeman in the big city stops a man in a car with a donkey in the front seat. "What are you doing with that donkey?" He exclaimed, "You should take it to the zoo." The following week, the same policeman sees the same man with the donkey again in the front seat, with both of them wearing sunglasses. The policeman pulls him over. "I thought you were going to take that donkey to the zoo!" The man replied, "I did. We had such a good time we are going to the beach this weekend!"